MANGALORE CITY : 807mm and MANGALORE Airport 889 mm. SSET ALL THESE PLACES ARE IN COASTAL KARNATAKA. THEY ARE IN AND AROUND MANGALORE. It seems Mumbai will reach its average for June right? When will it rain heavily there? light to medium non-stop rain in santacruz with windy weather. Today with Harnai, Palghar received 200mm. Harnai crosses 1000mm mark. Vihar lake 200mm ! So far we have received 220mm. The source is https://www.ksndmc.org/Weather_info.aspx. Its 5% below the actual numbers. Anyways even at 42 cms we are well over average rain so far. Till June end average rain is 27 cms. So we are 15 over it. SSET ITS 15 CMS OVER NORMAL FOR MANY REGIONS IN BANGALORE. So approx 30% excess. Next week (probably mid-end) Mumbai/MAHA again deadly rains just like now! (GFS models) july first weak Mumbai ready for blasting pours! @deepak ignore sset. He misrepresents facts and blatantly lies. This has been proved time and again on this blog over the last 4 years. That's why no one interacts with him. @rajesh sir this is why I request you to block sset's comments which are so obviously wrong. Anyone new to blog and comments section would treat sset's agenda as truth. 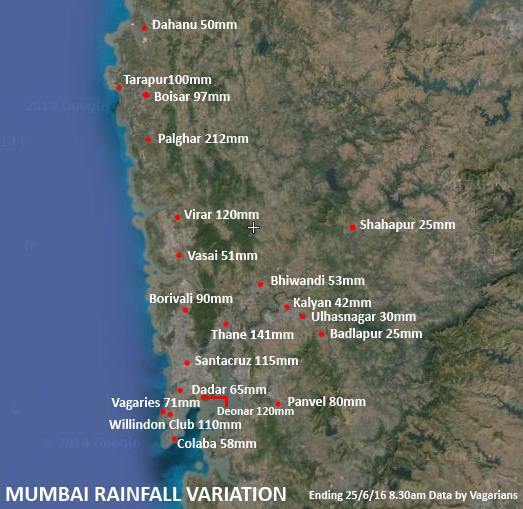 Thanks a lot to team vagaries for updating us with rainfall figures for mumbai and surrounding regions. UAC formed in the Bay and another off the North Konkan coast. Because of this Konkan UAC, Vagaries had mentioned in the forecast of rains moving North along the North Konkan and Gujarat coastline from Saturday evening /Sunday. Bay UAC may become a Low.As a Low, or an UAC, it will move westwards and cross the AP coast. Mumbai will continue with the current wet spell on Sunday also. All inland regions are slow in getting proper monsoon showers, including all ghat stations. Interior Dams like Vaitarna and Bhatsa supplying water to Mumbai will get moderate heavy rains from Saturday and also Sunday.Bhatsa, Tansa and Vaitarna got moderate rains on Saturday. Deepak Kotian:Vagaries forecast is given in blog and put up regularly. Cannot compare with another forecast or comment on that. Heavy rains will continue in Mumbai next few days and chances of extremely heavy rains next thursday-friday. indore and ujjain when will receive heavy rain? Yesterday Navi Mumbai received 215mm of rain in 24hrs (season highest so far for Navi Mumbai)- see todays times of india-Mumbai. Can anyone tell what's the lowest ever recorded rainfall for Cherrapunji for the month of June. It's rained only 1016mm till 26 Jun for this year. Given IMD forecast for the next few days, I'm thinking it's quite possible Cherra will have its lowest ever June rainfall this year. Devgad 1000 mm. Also reached 1000 club. Sir,As per imd monsoon will not reach Delhi in June.your view?